Nevado Cayambe is a massive volcanic complex in northern Ecuador, 60 km NE of the city of Quito and only 15 km E of the 20,000 inhabitants city of Cayambe. The equator passes through its southern flank. The andesitic-dacitic volcano is located on the isolated western edge of the Cordillera Real in the Ecuadorian Andes, east of the Inter-Andean Valley. The volcano is capped by extensive glaciers, which descend to 4200 m on the eastern Amazonian side. 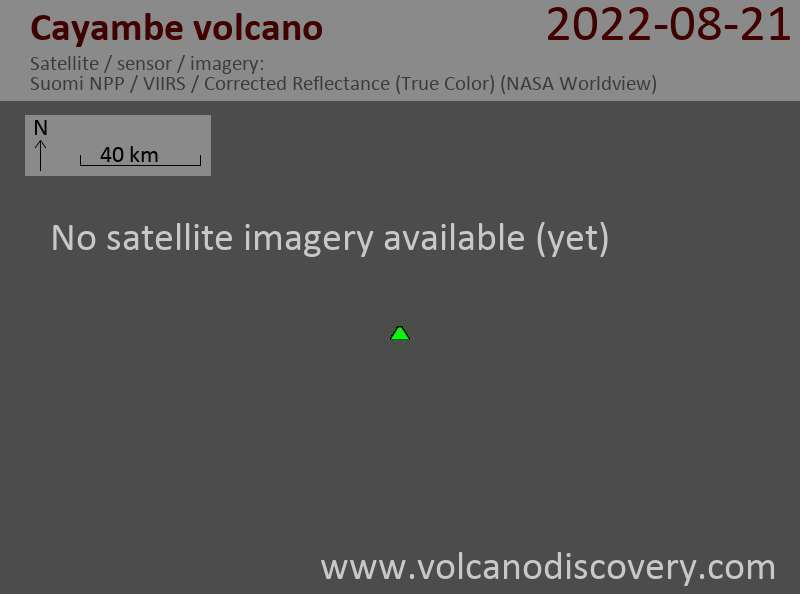 It contains 2 summit lava domes located about 1.5 km apart, the western of which is the highest. Several other lava domes are located on the upper flanks and have been the source of pyroclastic flows down the lower flanks of the volcano. La Virgen is a prominent young cinder cone on the lower eastern flank, which erupted thick andesitic lava flows that reached 10 km to the east. There is only one confirmed historic eruption, during 1785-86, but recent studies have shown that the volcano has produced frequent explosive eruptions during the past 4000 years. Увеличение землетрясений началась 5 июня этого года, когда сейсмической роиться землетрясений начала которых составил более 2300 событий к концу месяца. Землетрясения произошли сосредоточены в районе NE вулкана и были вулкан тектонического происхождения, скорее всего вызвано магматических вторжений на глубине, вызывая наддувом и трещиноватости пород. После июня Роя вулкан вернулся снова сначала успокоить. Новые землетрясения начали появляться в увеличение числа с сентября и продолжается. Отличается от в июне землетрясения были сосредоточены в рамках встречи на высшем уровне области вулкана и была указанием повышательная тенденция в глубину.